Before we get into this teaching I want to lay out a few definitions which will help for this series. Origin: Mid 17th century: from French, from Italian brigata ‘company’, from brigare ‘contend’, from briga ‘strife’. *A subdivision of an army, typically consisting of a small number of infantry battalions and/or other units and often forming part of a division. *An organization with a specific purpose, typically with a military or quasi-military structure. Origin: Late 16th century: from French bataillon, from Italian battaglione, from battaglia ‘battle’, from Latin (see battle). *A large body of troops ready for battle, especially an infantry unit forming part of a brigade typically commanded by a lieutenant colonel. *A large, organized group of people pursuing a common aim or sharing a major undertaking. In summary, to my understanding, a “battalion” is part of a “brigade”. Because the focus of this teaching is regarding the order for advancement (meaning God’s intended order for the advancement of His Kingdom), I will go through the information in that order and not the birth order of each son of Israel (Jacob). The brigade and the battalion of Judah were the first to go out (break camp) when the Lord called His people to move forward (Numbers 2:1-9). 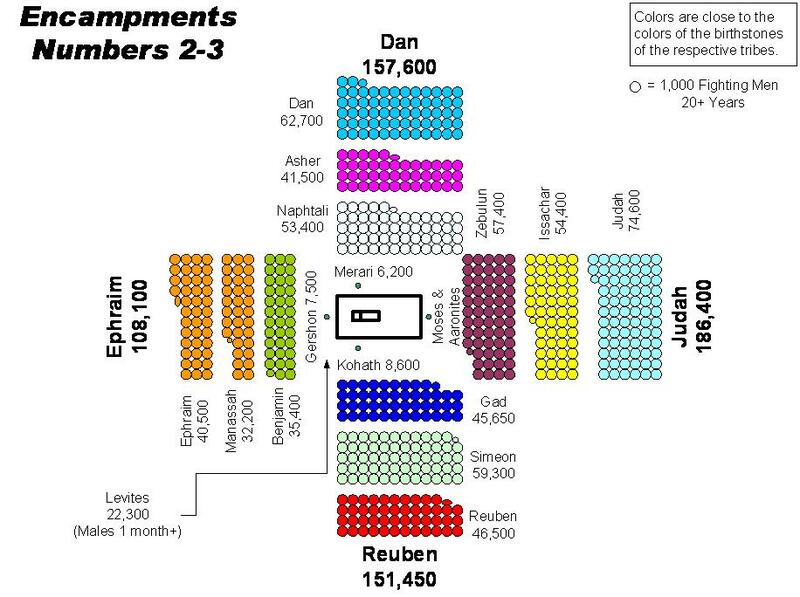 Judah was the 4th of 12 to be born. He was born to the lesser-loved wife of Jacob, Leah (Rachel, Leah’s sister, being the more-loved). Genesis 29:35 – And she conceived again and bore a son, and said, “Now I will praise the Lord.” Therefore she called his name Judah. Then she stopped bearing. The name Judah, in Hebrew, literally means praise. The first thing to happen in our individual advancement and corporate advancement is to be our praise. 2 Chronicles 20:20-22 – So they rose early in the morning and went out into the Wilderness of Tekoa; and as they went out, Jehoshaphat stood and said, “Hear me, O Judah and you inhabitants of Jerusalem: Believe in the Lord your God, and you shall be established; believe His prophets, and you shall prosper.” 21 And when he had consulted with the people, he appointed those who should sing to the Lord, and who should praise the beauty of holiness, as they went out before the army and were saying: “Praise the Lord, For His mercy endures forever.” 22 Now when they began to sing and to praise, the Lord set ambushes against the people of Ammon, Moab, and Mount Seir, who had come against Judah; and they were defeated. Before this, the Spirit of the Lord came upon one of the Levites who spoke from within the congregation. Through him the Lord encouraged all the people by telling them not to fear because this battle wasn’t theirs but belonged to God Himself. He then told them where they would find the enemy and to take position but be still. They would not have to fight. This word and promise is what admonished King Jehosophat to have the congregation praise God Almighty. Acts 16:25-34 – But at midnight Paul and Silas were praying and singing hymns to God, and the prisoners were listening to them. 26 Suddenly there was a great earthquake, so that the foundations of the prison were shaken; and immediately all the doors were opened and everyone’s chains were loosed. 27 And the keeper of the prison, awaking from sleep and seeing the prison doors open, supposing the prisoners had fled, drew his sword and was about to kill himself. 28 But Paul called with a loud voice, saying, “Do yourself no harm, for we are all here.” 29 Then he called for a light, ran in, and fell down trembling before Paul and Silas. 30 And he brought them out and said, “Sirs, what must I do to be saved?” 31 So they said, “Believe on the Lord Jesus Christ, and you will be saved, you and your household.” 32 Then they spoke the word of the Lord to him and to all who were in his house. 33 And he took them the same hour of the night and washed their stripes. And immediately he and all his family were baptized. 34 Now when he had brought them into his house, he set food before them; and he rejoiced, having believed in God with all his household. In this example, not only did prayer and praising the Lord loose the bondages but it also brought others into the belief of Jesus Christ by which they were saved (came into the Kingdom of God). I hope you are starting to see the picture unfold. Just as Paul and Silas were praying and singing to the Lord in their time of trouble, we are to do the same. We are to praise and communicate with the Lord in our good times and our times of need. We don’t only talk to those we love in our lives when we need something, right? No. We share our good times and our bad times with those we love and trust. We should be doing the same with our Lord. This is how a relationship works. Others come to Jesus, not by what we say but how they see us respond to the Lord working in and through us just as they did in the above passage. Genesis 49:8-12 – “Judah, you are he whom your brothers shall praise; Your hand shall be on the neck of your enemies; Your father’s children shall bow down before you. 9 Judah is a lion’s whelp; From the prey, my son, you have gone up. He bows down, he lies down as a lion; And as a lion, who shall rouse him? 10 The scepter shall not depart from Judah, Nor a lawgiver from between his feet, Until Shiloh comes; And to Him shall be the obedience of the people. 11 Binding his donkey to the vine, And his donkey’s colt to the choice vine, He washed his garments in wine, And his clothes in the blood of grapes. 12 His eyes are darker than wine, And his teeth whiter than milk. Moses also spoke a final blessing over each tribe. In any advancement of God’s Kingdom (whether within yourself, your church, or the corporate Body of Jesus Christ), the first part before anything else is that Jesus must be before us and our praises and worship of Him are to be before anything else we do. Our praises include our prayers. The promises are laid before us. We are to believe in the promises and praise the Lord for them. This is the first to be done in God’s advancing army. There are a multitude of writings that could come just from this little portion of information. However, I will not go through it all at this time. There is probably another multitude of writings that I have not even conceived of yet. Holy Spirit will provide all that is needed at the exact time it is needed. Call out to the Lord for more understanding of His Word. He will give you what you need, how you need it, and when you need it. Praise Him before the storm, during the storm, and after the storm. Judah (praise) is the first to go forward.